The FEI recently released the Regional as well as the FEI World Classification results based on Individual & Team results for the 2018 FEI World Dressage Challenge. 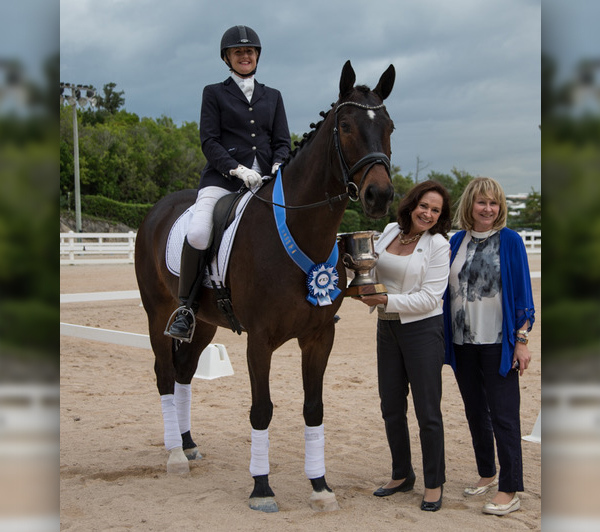 Bermuda dressage riders, once again, achieved very commendable results. Under the Regional Classification based on individual results, Bermuda’s National Coach Angela Halloran Smith riding Finnomenal AV obtained the top placing for the Senior II Class, whilst promising junior rider, Kelsey Amos riding Wiratoro placed 1st in the Youth Class. In the Senior 1 Class, Virginia McKey riding Matinee placed 2nd and Claire Turner riding Landtango placed 4th, while Bermuda’s Regional Dressage team claimed second place to Barbados. Other competing regional countries included Dominican Republic, Haiti as well as Trinidad. Under FEI’s 2018 World Dressage Classification based upon individual results, Bermuda dressage riders achieved admirable rankings. In the Senior II class, Angela Halloran Smith secured a commendable 5th place out of a field of some 124 competitors. In same class, Robin Stempel riding her new horse, Rossano Royal 2, placed 59th. In the Senior 1 Class, Virginia McKey riding Matinee placed 17th out of 165 competitors whilst in the Youth Class, Kelsey Amos & Wiratoro placed 12th out of 115 competitors from around the globe.